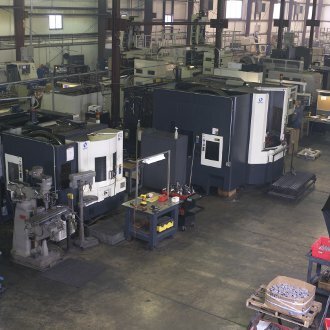 Ansco Machine Company of Cuyahoga Falls, Ohio, is a full-service contract machine shop that specializes in milling and turning. The company produces hydraulics, press rings, steel mill components and automation/motion control components. It works with high-volume production and small lots in a wide variety of materials, from carbon and alloy steels to ductile and gray irons, plastics and exotics. Mike Sterling, the company’s owner, understands not only the parts being produced but also the larger context in which the parts are to be used. This awareness helps Ansco to be a partner that can help clients overcome design and manufacturing challenges. Ansco needed a high-performance horizontal machining solution that would speed up production. It was looking for machines that could handle everything from the smallest to the largest parts. Speed was also important to help the company meet tight delivery times. In addition, the machines needed to be reliable enough to last as long as 10 years. Ansco hoped that this range of high-performance horizontal machining centers would give the company the ability to produce the same part in many different sizes at the same time without wasting work-zone space on its machines. Several of the company’s machinists traveled to Makino’s Mason, Ohio, facility to receive training. These five high-performance horizontal machining centers enabled the company to quote and deliver any size part. With pallet sizes ranging from 15.7 inches to almost 40 inches, and the ability to accommodate a variety of tool sizes, the Makino equipment enables Ansco to match the appropriate machine to the appropriate job without over-investing in capital equipment. Ansco reduced production costs by 17 percent on one particular product family it produces while improving the overall product. Now it no longer has to stock the product, but produces kanban quantities and sends them out when needed. The company has seen dramatic improvements in setup and production times. On a rotary actuator housing made of aluminum, it used to take one hour and 20 minutes to complete; on a Makino high-performance horizontal machine, it takes only 22 minutes. Quality and consistency are also improved. On a part where Ansco produces 770 units and checks the consistency the 81 features of this part for quality control, Ansco was the only shop to provide the part with zero defects. These high-performance horizontal machines also give Ansco the redundancy it needs should production volume increase. The company is able to meet its goal of producing entire families of parts for its customers.